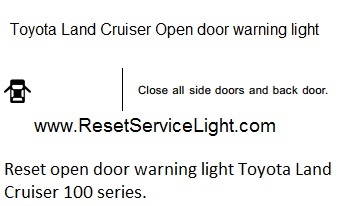 That it is the full procedure how to reset open door warning light Toyota Land Cruiser 100 series. If you like to reset any maintenance oil light after an oil change. Or reset check engine light, airbag light, inspection key or insp errors when maint reqd, for Toyota cars. Or any warning light for service reminder which appears on the display. Write in the search box the car name for which you want to find information, and find how to reset other service reminders by yourself. I have a 100 series Cruiser, the door ajar light will not go out. Ive taken all switches out including the rear tail gate but the light will not go out , the interior light does not come on when the light on the dash is on even when all doors are closed, ive had a scanner put on the vehicle but no faults indicated. Hello Ron, from what year it is your car ? Have a similar issue to Ron. Our 2006 100 series door ajar light comes on when you insert the key I to the ignition. No dome lights, just the dash warning as soon as the key enters the ignition. Did you ever find a solution to this, mine just started doing it? Most likely a sensor from a door is faulty and this has triggered the “open door warning light”.